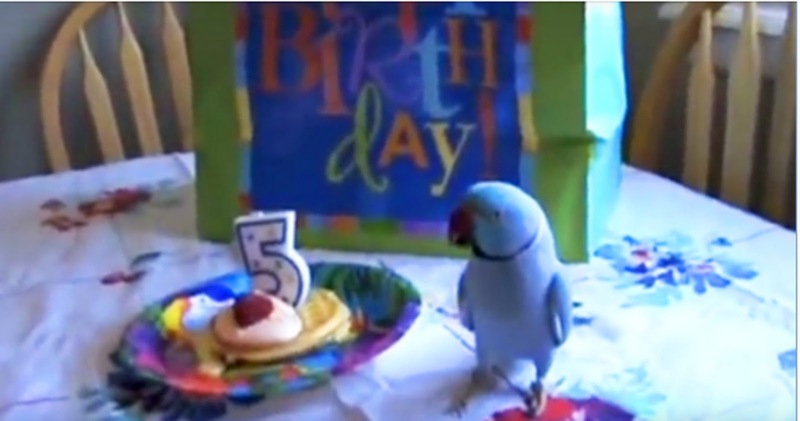 This Parrot’s Humans Give Him a Suprise Birthday Gift. How He Reacts? Priceless! It was Marnie’s birthday and by golly his mom was going to throw him a party like no other 5-year-old parrot has experienced! Yes, Marnie is a Blue Indian Ringneck Parrot and was the recipient of one epic parrot party! Not only did Marnie get some awesome snacks (like waffles with strawberries and cream), he was also greeted by all his bird friends and his dog friend too! Needless to say, Marnie was beside himself! He was totally thrilled! His reaction really tells you just how special this guy really is. He even got birthday presents, one of which was a stuffed bunny rabbit. He actually gave the bunny a kiss and said to it: “I love you”! Wow! Each gift is followed with a “thank you” and other cute phrases that the parrot knows. His favorite phrase seems to be “gimme kiss” as he’s quite the kisser and a “polite Casanova” according to his owner. He developed an affection for stuffed Easter bunnies, probably because he was adopted around Easter time, and his owner introduced him to a talking bunny doll she had just received. His speech has grown ever since then! Give this guy a look and no doubt you will be smiling ear to ear afterwards! Super cute! Share this amazing parrot with friends and family!